Want to be able to place a to-go order on command? With our skill, you can order your favorite food handsfree without having to go online or call! Our client, Vert, tasked us with identifying a way to use the Amazon Echo to assist restaurants. 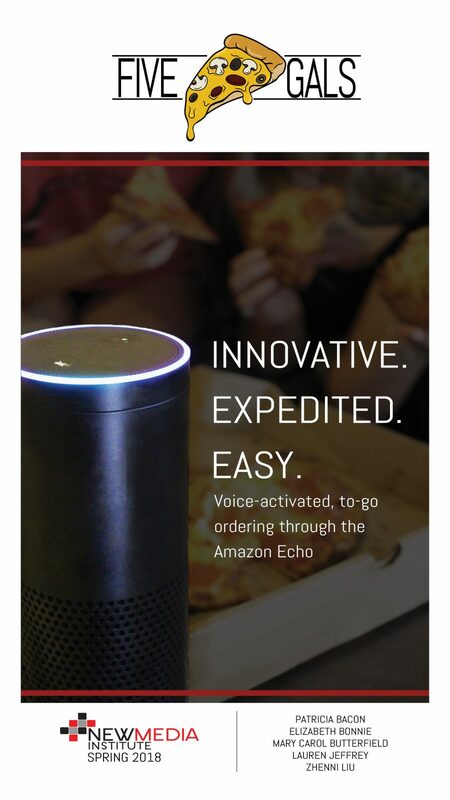 We realized that some restaurants don’t have delivery capabilities or aren’t located in cities included in Amazon Restaurants, so we created an Alexa Skill and a mock pizza joint, Five Gals, to showcase its capabilities. We aim to make food-ordering easy and efficient using the Amazon Echo, an Alexa voice-activated device. For customers, our skill makes ordering simple because they won’t have to go online or pick up the phone to place an order. For restaurants, our skill offers the chance to provide quick and innovative services to their customers, especially smaller places without delivery capabilities.